Nicole messaged me a few weeks ago with a unique, heartbreaking story - her mother had recently passed away and had left Nicole’s children something that they’d always loved: her Mini Cooper. Since they’d decided not to keep the car they wanted to have a special photo shoot with the Mini and the whole family as a remembrance. 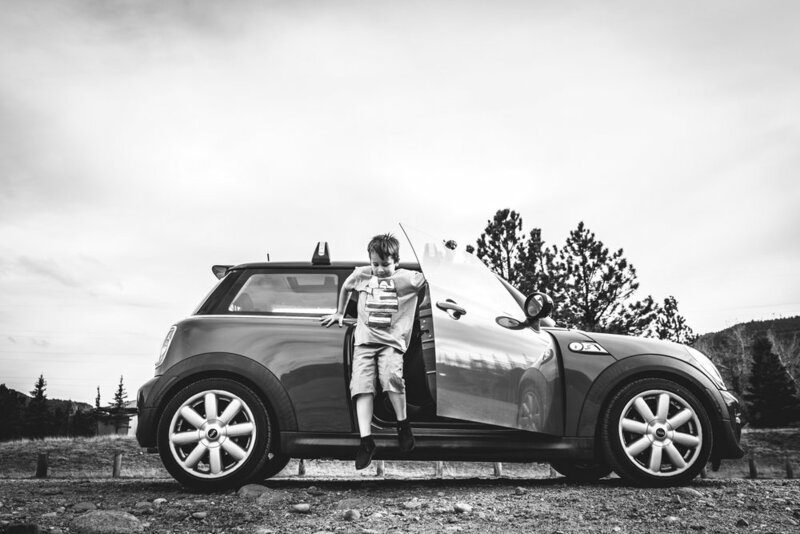 So together we came up with a plan for the perfect documentary Mini Cooper adventure: a road trip around Estes Park, Colorado. We made several stops on this adventure, first to see a group of elk who had wandered onto a golf course and set up camp and then to a beautiful lake with the mountains in the background. The family spent some time fishing, each parent grabbing a child to show them how it's done. They ended the day with a quick swig of Nicole's mother's favorite drink - Jack Daniel's - and then headed home. It was such an honor to be given the opportunity to document such an important memory for Nicole and her family. They were so absolutely lovely and kind. I wish I had better words to explain how I felt about this session but hopefully my photos were enough. If you would like your own documentary family or adventure session, please contact me here.